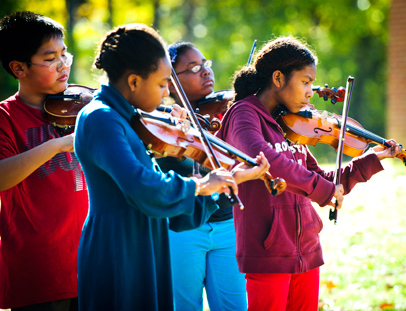 Music wafts from the classroom cottages at Greensboro’s Peck Elementary School. A UNCG graduate student stands in front of the class of fidgety fifth-graders, violin in hand, giving clear instructions on what she wants them to play. The adolescents are part of the Peck String Lab, a hands-on, collaborative music class between the UNCG School of Music, Theatre and Dance; the Greensboro Symphony; the Music Academy of North Carolina and the elementary school. Students and faculty from UNCG and the music academy provide instruction, the symphony provides the instruments and the elementary school hosts students eager to learn how to play the violin and cello. Dr. Rebecca MacLeod, an assistant professor of music education in the School of Music, Theatre and Dance, piloted the Peck orchestra program and has shepherded its growth over the past four years. The program is unique: Of the 67 elementary schools in Guilford County, only three has a orchestra program. MacLeod understands the students’ excitement. She dreamed of a similar experience as a 6-year-old musician, longing to play her violin with friends but facing the reality that, for many of their families, music lessons just weren’t in the budget. Personal instruments and private lessons are also out of reach for many students at Peck, where more than 95 percent of students qualify for free or reduced lunch. MacLeod set up the music classes to meet during the school day so as not to conflict with parents schedules. But to accommodate that schedule, students had to make a difficult choice: orchestra or recess. We always have more children interested than we have instruments. They’re missing (recess) three times a week to come to orchestra. The Peck students aren’t the only ones learning. For UNCG’s teachers-in-training, volunteering at Peck is practical education that goes beyond books. Read the full feature on the Peck String lab in the Spring 2012 edition of UNCG Magazine.